I'm back, sort of. When the wonderful Miss Whistle asked me to share a favorite recipe for the January Jeliciousness series on her blog, I jumped at the opportunity. I do miss flexing my creative muscles (wee ones, mind you) by styling and photographing the things that I make. For I have not neglected my baking and cooking as I have this blog. In the spirit of testing the waters for a possible return to more regular posting here on Flour Child, below is the recipe I'm sharing on Miss Whistle. I'll be back again soon, maybe. In the meantime, please visit Miss W's blog for recipes, musing and lovely things. If the menu at David LeFevre's restaurant, M.B. 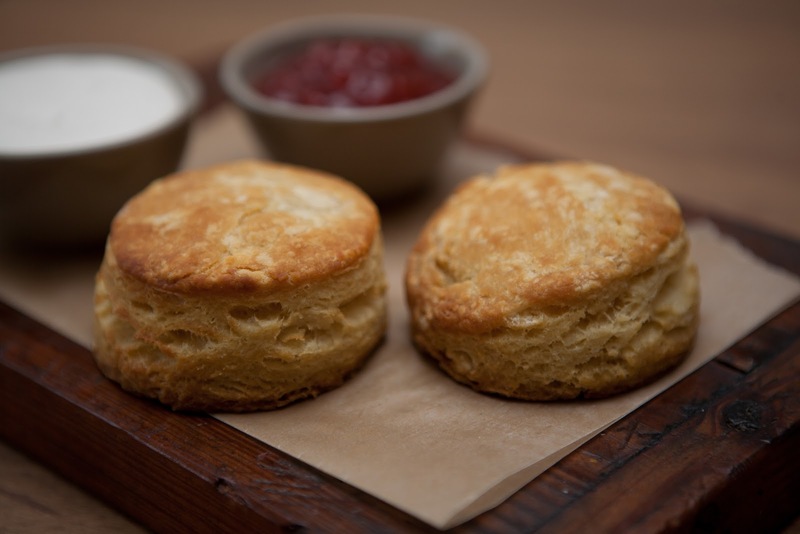 Post, in my hometown of Manhattan Beach, California, isn't tempting enough already, the bacon cheddar biscuits are reason alone to dine there. 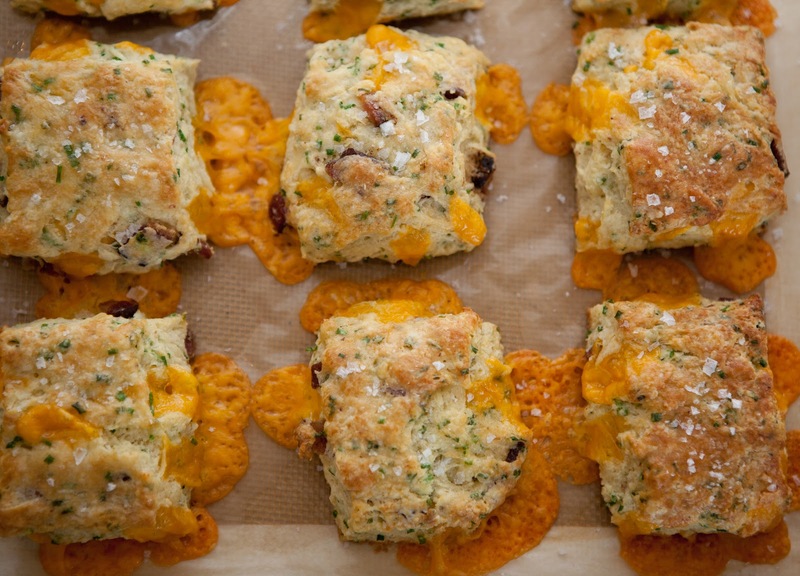 Studded with smoky bacon and sharp cheddar, the dough is surprisingly tender and light. When my girlfriends and I meet at M.B. Post for brunch or dinner, you won't hear a single word about dieting, nor do we feign guilt at eating these biscuits. They're an utterly worthwhile indulgence. And while I appreciate that many (most) of us are focusing on virtuous eating now that the holidays are over, there's something to be said for gently easing back into healthy habits. So rather than quitting the bacon, butter and cheese cold turkey, you might make these biscuits for your next supper or brunch. Just don't eat the entire batch (easier said than done), and maybe serve them with lighter fare. *The Los Angeles Magazine version of this recipe states that 12 ounces of all-purpose flour equates to 1 1/2 cups. When I measure 12 ounces of King Arthur All-Purpose Flour using the spoon and sweep method, I get 2 3/4 cups every time. 1. Heat oven to 375 degrees F and position a rack in the middle of the oven. 2. In a medium bowl, whisk together the flour, baking powder, baking soda, salt and sugar. Add the frozen grated butter and mix gently with a spoon until evenly distributed. 3. Add the cheddar cheese, bacon and chives and gently mix again to combine. 5. Gently roll out the dough to 1 1/4 inch thickness and cut into 2 1/2 inch squares or rounds. 6. Brush the biscuits with clarified butter and sprinkle with Fleur de Sel. 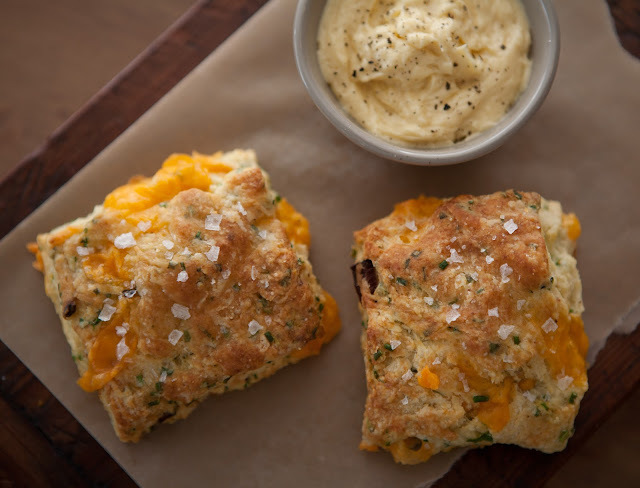 Minus the bacon, cheddar and chives, this recipe makes the absolute best plain biscuits; they're perfectly light and flaky with a crisp exterior and soft interior. (I dare say, they're better than Scott Peacock's version.) Do experiment with other savory or sweet mix-ins, and let me know how they turn out. I KNOW it's probably sacrilege to ask but have you tried making these gluten free? I'm in Hermosa by the way. Neighbors! Hi, neighbor! Your question is not sacrilege at all. I do plan to try a gluten free version... someday. I expect I'll start by simply subbing Cup4Cup flour for all-purpose (wheat) flour in the recipe. If/when I get around to it, I'll update this post with results.